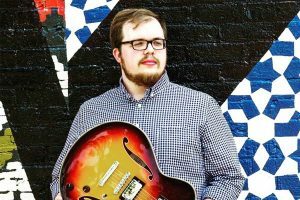 Local musicians and educators Zakk Jones and Danny Bauer have collaborated with Jazz Arts Group to create the 4th Floor Live Series at the Jazz Academy. With a name inspired by the Jazz Academy’s location on the 4th floor of the Lincoln Theatre building, this monthly series of free events aims to bring new experiences to a variety of Columbus jazz audiences. Up next in the series is Brandon Coleman’s Fourth Kind, “a modern jazz group focused on interplay, texture, and adventure,” on Thursday, February 21st, 7 to 9pm (more details here). Jones, with assistance from the 4th Floor Live team, was kind enough to answer my email questions about the series. Keep reading to learn more about its focus and what’s ahead, and drop by the Jazz Academy for one of these upcoming events! I was excited to hear about the 4th Floor Live series! How did this concept come about? Zakk Jones (ZJ): Danny and I were approached by Zach Compston, Director of Education and Community Engagement at the Jazz Arts Group (JAG), to be involved with producing musical and educational performances. Through brainstorming and combining a few elements, we ultimately ended up creating the 4th Floor Live series. We wanted a musical experience that targeted audiences who yearn for the high-level talent the Midwest has to offer in a space purely designed for listening and discussion. JAG has provided the financial support and promotion for the series, hoping to introduce this performance setting to its loyal audience for CJO/JAG concerts and education programming. How did you pick artists/ideas to feature? What can you tell us about the lineup of concerts you have scheduled? How do you think the series will contribute to the Columbus jazz scene? ZJ: There is no shortage of talent, creativity, and exploration in the Columbus Jazz scene. It’s truly a city that respects the tradition laid before us, while actively seeking new opportunities for growth and inspiration. 4th Floor Live has created a unique experience that showcases broad local offerings in a space that lets listeners actively participate through questions and discussion. With the generous support of JAG the artists don’t have to worry about promotion in order to get people in the door and make money, which affords them the opportunity to focus solely on bringing a high-level performance to a curious and inviting audience. We hope the series will help solidify Columbus’ place as a musical hub for Jazz and beyond in the Midwest. What audiences are you looking to target with these shows? ZJ: One of the primary goals for the series was to provide a space for curious listeners that lies somewhere between the quiet theater and the late-night club experience. From budding young musicians to local fans of live music, we aim to draw an audience as eclectic as the music we’re offering. Anything else you’d like to add for those thinking about checking out 4th Floor Live? What is the schedule of upcoming 4th Floor Live concerts? ZJ: Below are the dates for the upcoming series events! Note that they all occur on Thursdays, 7-9pm at the Jazz Academy, located on the 4th Floor of the Lincoln Theatre at 769 East Long Street, Columbus, Ohio 43203.